Volcanology is one of the Geologic sciences dealing with the formation of volcanoes, their geological structure and relationship with other geological processes, as plate tectonics, mountain building and earthquakes. The study of eruptive activity and the kind of material ejected is essential to determine the causes of volcanic eruptions, and to forecast their occurrence. The reconstruction of past events is also important to understand how Earth’s surface has changed over time. The eruption of Mt. Vesuvius (south Italy) in AD 79 recorded by Pliny The Younger is an example of past events described in considerable detail that helped us in studying volcanic eruptions. The principles of geophysics, geochemistry, seismology and geodesy have helped scientists to understand more of the processes that occur within the Earth’s interior. Our research interests are focused on the relationship between volcanic eruptions, plate tectonic and earthquakes. 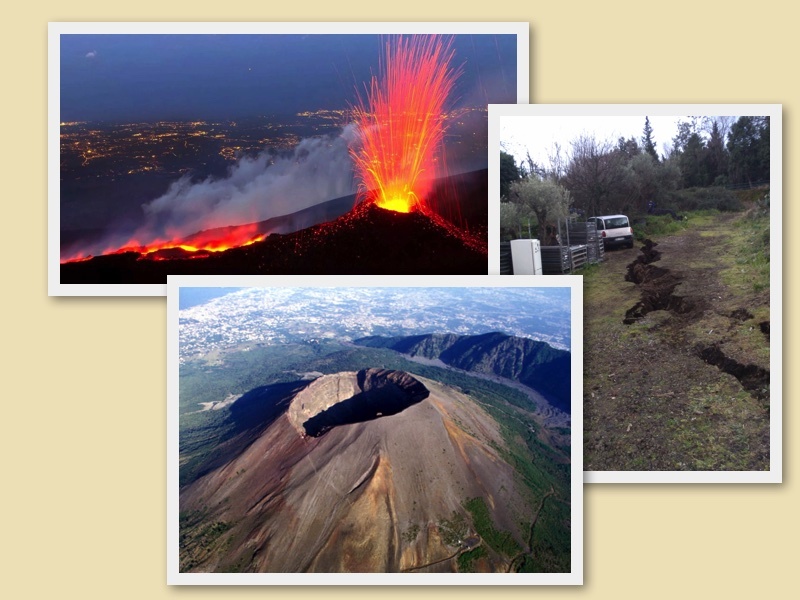 In this regard, we are currently studying the volcano-tectonic activity of Mt.Etna. On the left-top: Mt. Etna (Southern Italy) eruption. On the right-top: Effects of the volcano-tectonic activity in during Dec 26, 2018 Valgrande earthquake, at the foothills of Mt. Etna. On the bottom: View of Mt. Vesuvius (south Italy).